I started writing this blog enty sat aboard the first Locomore / Leo Express / Flixtrain / Flixbus service, departing at 1419 on 24th August from Berlin Lichtenberg to Stuttgart. I was only going as far as Berlin Hauptbahnhof, but that’s enough time to test the onboard wifi. Solid so far I can confirm. But what is this train, and why am I on it? Locomore was a crowd funded train service that started in December 2016 running one train each way each day between Stuttgart and Berlin. In May the firm went insolvent. But now it is back. 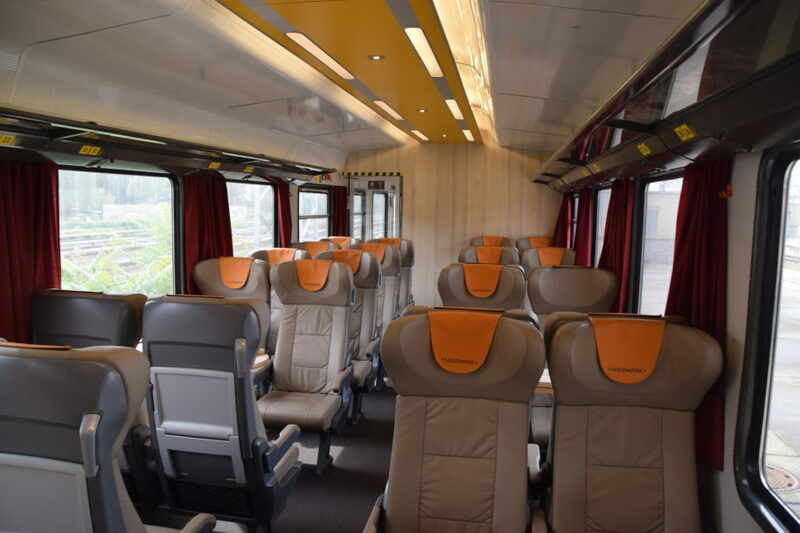 The Czech private rail (and bus firm) LEO Express acquired Locomore’s rolling stock and applied for a German operating license that was granted yesterday – but under the name FlixTrain. The main online information about the service is on the FlixBus website here. That then leads us to the question: what is this service, and how is it all going to work? Having been at the (re-)launch of the service at Berlin Lichtenberg it’s not clear that how this thing is going to be branded. The carriages still prominently carry the Locomore brand. The departure boards at the station say LEO Express. 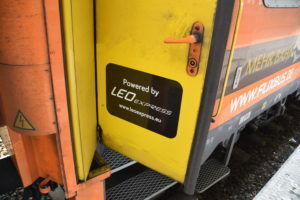 Stickers on the train say “powered by LEO Express” but further stickers say “Mehr Bahn. Flixbus.de”. The service will run 5 days a week initially (Thursdays until Mondays), departing Stuttgart early mornings and Berlin Lichtenberg early afternoons. Interim stations are Vaihingen an der Enz, Heidelberg, Darmstadt, Frankfurt am Main (Süd), Hanau, Fulda, Kassel, Göttingen, Hannover and Wolfsburg. The clever thing here is that cities otherwise not linked directly by DB – Heidelberg and Berlin for example – are indeed connected by Locomore. There are open carriage sections (shown above), compartment carriage sections, child areas, bike areas and a small cafe-bistro area. It’s all one class. The carriages are old DB stock, refreshed in Romania, and capable of 200km/h. There was much discussion among the people I spoke to at the launch about whether this new service will work any better than Locomore initially did. LEO Express’s public affairs person Barbora Mičková underlined how competition between LEO Express, their private rival Regiojet, and Czech state incumbent ČD had led to increases in passenger numbers and reductions in prices on the Prague-Ostrava route where they all compete – that, she told me, was the aim here too. New passengers for rail. 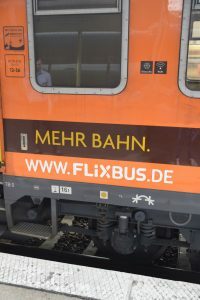 However the cooperation with FlixBus would seem to place the new service as somewhere between the market for long distance buses and Deutsche Bahn’s more premium InterCity and ICE service. Although having said that the open seating in the Locomore carriages is a good bit better than a DB Intercity, and there is onboard wifi too. A rough back-of-an-envelope calculation from one of the nerds at Lichtenberg calculated the train has running costs of €30000 per day Stuttgart – Berlin – Stuttgart, including cost of the path, lease of the locomotive, staff etc. The train had 6 carriages today, each of which can sit max 70 passengers each, so 420 total. 840 total for there plus back. €30000 divided by 840 gives you an average ticket price of just over €35. Looking at the prices for the next few weeks and you can get yourself to Stuttgart for just €29, so this will likely be running at a loss for a while at least. Plus trying to take on Deutsche Bahn on Berlin-Stuttgart is a rather different proposition than taking on ČD on Prague-Ostrava! All of this demonstrates the complexity of trying to get a new rail service running in Germany. So today it seems is just the start. Many questions remain. But I wish LEO Express all the best with this venture. And with the experience gained in Czech Republic, and with the backing of FlixBus and tickets already for sale on Trainline.eu, the chances of success must be better than Locomore’s were. Time will tell! NOTE: pics of the launch, CC Licensed and available for re-use, are on my Flickr account here.